Duchess Kate: A Christmas Family Photo Released & Prince George to Begin Montessori School in Norfolk! 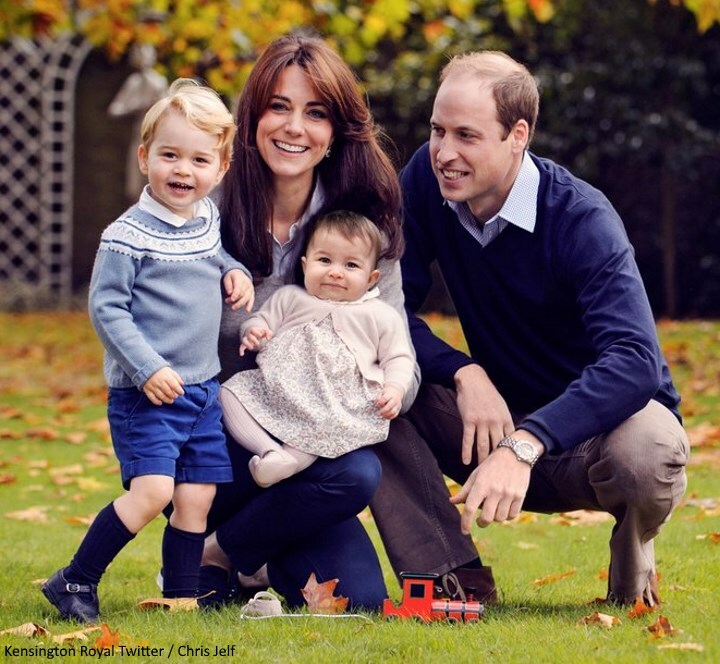 A Christmas Family Photo Released & Prince George to Begin Montessori School in Norfolk! A Christmas surprise from the Cambridges came today when Kensington Palace released a new official photo of the family which will be used on William and Kate's Christmas card. The photo showing the Duke and Duchess with their smiling children Prince George and Princess Charlotte was taken among the autumn leaves at Kensington Palace in late October. The Palace said the photograph was commissioned for their own use, but that the couple decided to make it public because they liked it so much. Mr Jelf, from Wiltshire, who developed his photography skills while serving in the British Army, described the family as 'lovely'. He said he is 'most happy' when photographing people, capturing their personalities and a moment in their lives. 'I thoroughly enjoyed photographing a very lovely family, although you have to be sharp as you don't have long when there are two young children involved!' he said. It's a beautiful family photo, and one I expect takes pride of place at their home. It's very much the type of photo we know William and Kate favour: an informal, natural shot set against the beautiful backdrop of an autumnal day at Kensington Palace. They all look incredibly happy and there are lovely smiles from the adorable tots! A couple of rather cute details from the photo; Charlotte is wearing only one shoe, you'll notice her other is on the grass. We also see Prince George's red toy train. 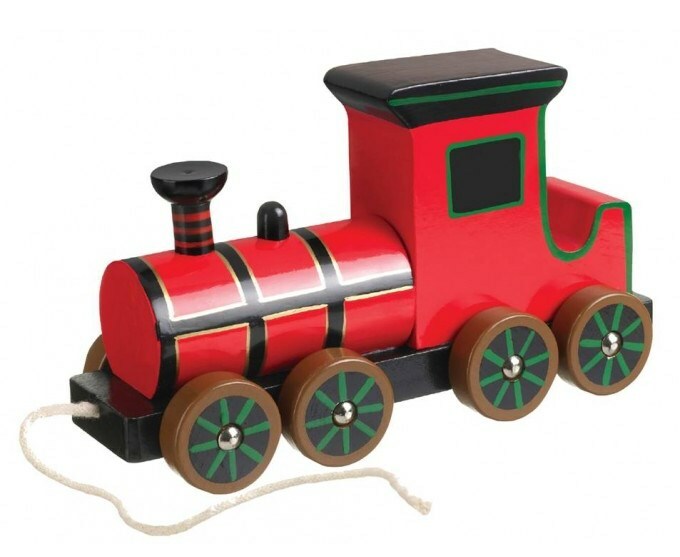 The eagle-eyed Monique Jessen discovered the wooden train is the £15 Steam Train Pull Along available at Orange Tree Toys. It's described as: "Painted in red, with beautifully painted detail to replicate a traditional Victorian steam train." 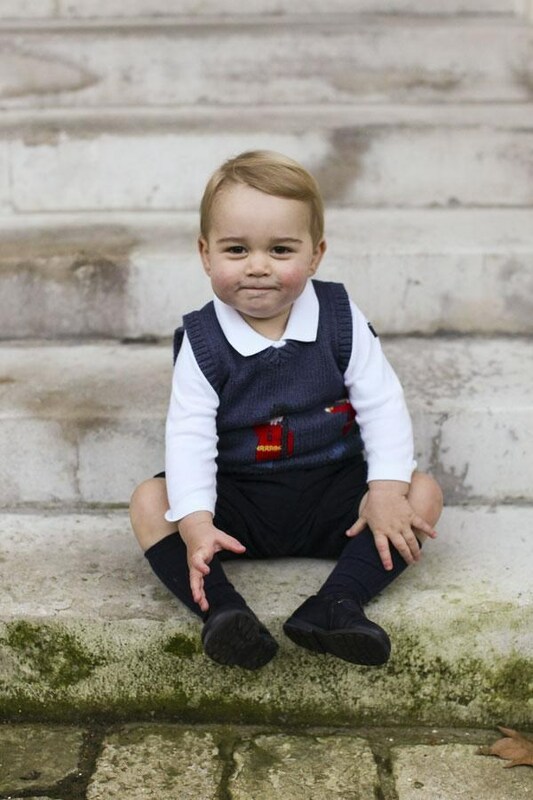 Last December William and Kate released new photos of George to mark Christmas. The oh-so-cute photographs were an unexpected treat as the family photo is today. It's lovely to see the four of them together and I do hope it marks the start of a tradition of releasing Christmas card photos. 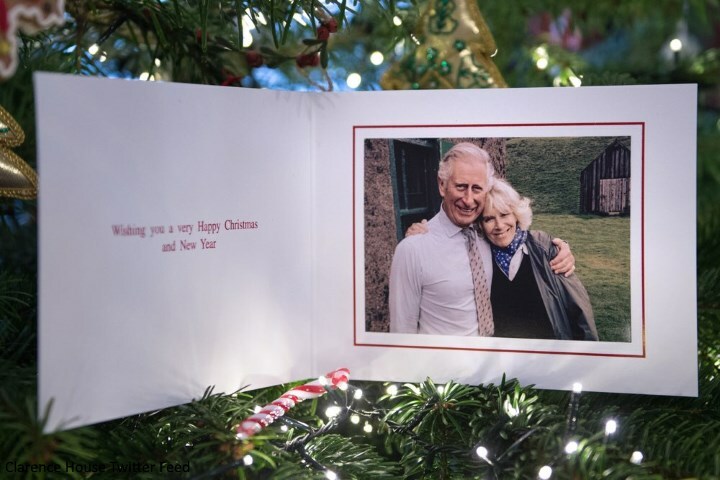 Speaking of Christmas cards, Prince Charles and the Duchess of Cornwall's choice of photo has proved very popular. A relaxed image of the couple embracing in the countryside over the summer was taken by a friend. You will all recognise Charlotte's outfit as the same one worn for the new official portraits of the Princess taken last month. The liberty print dress with white collar was reporttedly a gift from Nanny Maria Teresa by Spanish brand M & H. The little Princess was also wearing her Amaia Kids tights. Big brother George looked festive in a blue jumper with fretwork by Spanish-based brand Fina Ejerique (with many thanks to Monique Jessen). The jacquard sweater is 70% acrylic and 30% wool and is currently reduced to £22 at Margartia and Co. George also wore his Start-Rite Jo shoes, Amaia Kids socks and blue shorts. The Duchess was casually attired in a grey jumper with a blue shirt, skinny jeans, navy plimsolls and her sapphire and diamond earrings. Kate is holding Charlotte so it's very difficult to be certain which brands the ensemble is from. We'll update the post if any of the pieces are definitively identified. 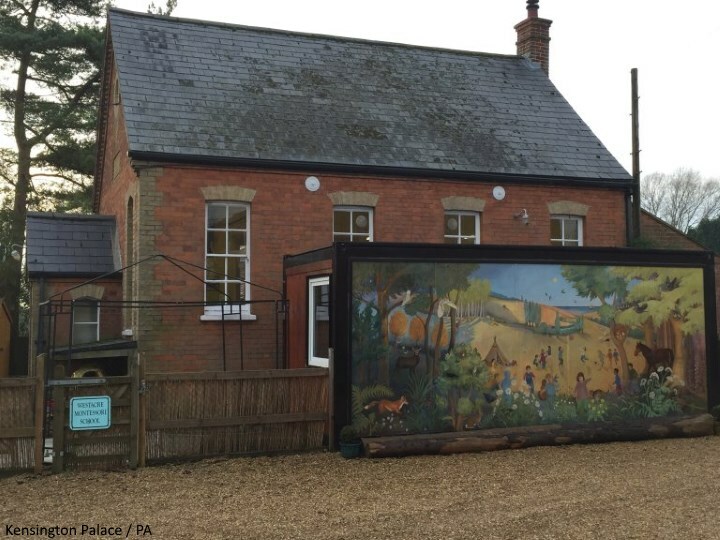 The release of the photo coincided with news that Prince George will begin to attend the Westacre Montessori School Nursery in Norfolk before the end of January. The nursery is only a few minutes from the family's country home Anmer Hall and George will only attend while the family are staying there and will not be enrolled in classes when they are in residence at Kensington Palace. 'The news is the latest evidence that the Duke and Duchess regard Norfolk as their main home, rather than their London residence at Kensington Palace. They have also stayed true to their belief that their children should have as normal an upbringing as possible. The school costs just £5.50 per hour, or £33 per day, and 23 of its 27 children are in receipt of funding. It also has some children with special needs. The Queen and Prince Philip arrived in Norfolk yesterday to begin their festive break and I expect the Cambridges may be at Anmer Hall too, making last minute preparations. The Middleton family will most likely head to Norfolk shortly for their second Christmas at Anmer. Such a happy post! Thank you, Charlotte, for putting it together. The family photograph is lovely and exudes happiness, and that of Prince Charles and Camilla is equally as lovely. It is a pleasure to observe such a genuinely happy and loving family. It is also great that George will start nursery school! I remember loving it when I was a kid. It'll be nice for him to be able to play freely with other children! I hope all of you are enjoying this festive season. Less than one week to go!!! What a lovely, love-filled family portrait! Kate and William have formed a strong, loving family unit and it just radiates from this picture. They like to keep things casual, and it really suits them. They are slowly but surely creating their own version of royalty for the new generation, and I find it incredibly refreshing. Charles and Camilla's portrait is just plain cute! (Can't believe I would ever use that word to describe those two). Thank you for all your efforts Charlotte, I enjoy coming to this blog daily for your insightful posts, as well as all of the diverse comments. Thank you everyone, and happy holidays! the RF has definitely landed on its feet after the tumultuous decades of change prior to now. Diana changed things forever and it shows. So thankful to see both families happy and healthy. Is George SO adorable or what? And even at five months, Charlotte does exude a very "ladylike" demeanor. What a lovely picture for us all! Merry Christmas and a peaceful New Year to all. The Cambridges look charming (as we knew they would) and I am just thrilled to bits that they get a relatively quiet, country Christmas. Charles and Camilla's card is probably the most relaxed and loving card of the two of them I have ever seen. You can tell what a love match that relationship really is. And HM looks lovely too. What a pleasant surpise as I get ready to put up my tree today! Thanks Charlotte for all that you do on the post and to all our fellow followers out there in Internet land- we hope this year is full of good news for us all! Thank you HoosierLori for stating so well exactly what I was thinking! Maybe it is because I am a Hoosier too, although living in CA for many years now! Looking forward to the photos of Christmas morning as well! Well that is the most adorable picture of a very beautiful family. They all look so happy and healthy, to say nothing of their movie star looks. I hope they have a wonderful Christmas as their family of four. I also thought that Charles and Camilla's photo was lovely. Here again they look so happy. Well done! Lovely - just absolutely lovely!!!! I was so excited to see this today. What cute, adorable, huggable kids they have! Thank you Charlotte for posting so quickly! You are amazing. Bev: I feel the same about Harry! I hope he finds the perfect mate and soon so his children can grow up with George and Charlotte. I think Charlotte looks a lot like Carole in that photo. And I love the dropped shoe and standby train and how William is perched ready to corral George as need be. So happy they shared this little window into their lives. Very sweet. I think Harry's girlfriends - and prospective serious girlfriends - get a look at what's happened to Kate and run the other way, which is unfortunate. Kate worked and waited close to a decade to marry a prince and her schtick is to be the meek and submissive, nearly-mute, non-controversial wife to William. Which is fine, it appears it suits them both. I think every royal wife puts her own unique stamp on her own unique role and hopefully, Harry will find someone who sees beyond Kate and realizes she can be (mostly) whatever she wants to be in that role. I will always believe that Chelsy Davy is and was the love of his life, they had a special fire between them that was absolutely electric and that he hasn't seemed to have with anyone since, including Cressida. As William was scarred by his parents' dysfunctional marriage, I'm sure Harry was too. Hopefully not forever! Sorry Elizabeth, but I see nothing wrong in the way Kate is fulfilling her role as Williams wife and at the same time developing into her future as Queen Consort. Whatever she is doing it is working and both she William including George and Charlotte come across as very happy and content with their current life. Not every women needs to have an independent business or professional life to be successful. Kate is very successful in her current role and just what the Monarchy needed to continue. I believe a big contributing factor to their break up was the kind of miserable negative comments and attitudes that always find their way into this comment section. Who in their right mind would subject themselves to this seeing to what Kate has been subjected! Some of us would wish for more than mute and dutiful, 1949. I don't think that Kate is what the monarchy needs to continue. I wish she was - and she could be - but she hasn't shown much so far. And they did not break up in 2007 because of miserable and negative comments; forgive me, but that's ridiculous. She put up with a lot, all right, but it wasn't from commenters on blogs. And before I forget -- for the comment counters: they are adorable children indeed. If you ask the children who have interacted with Kate when she has come there to help, I think they would say Kate is just what the monarchy needs. Those children are free to disagree with me. But being a head of state or consort of the head of state is a lot more than just smiling for photographers, posing for photos and engaging with children. William is now getting access to the same state papers Charles is getting so much stick about. There's a lot more than just having bouncing and behaving hair and lovely outfits. We can speculate either way. The proof is in the pudding and time will tell. I personally think W/K will do a superb Job. At this time, Kate is not the consort of a head of state. She is the wife of a future king and she is raising a future king while she prepares herself for a role from which there is no retirement. And while I am not convinced that that W&K broke up because of negative comments, I do believe it takes a hell of lot more than bouncing hair and pretty outfits to take on the role Kate did while maintaining her sanity and staying true to herself. The qualities Kate brings to the table shouldn't be dismissed so easily, especially given the marital disasters of three of the Queen's four children. Some people are not hopeful about Kate's abilities, some people are. I am in the hopeful group. You are confusing me a bit, bluhare. William is now reading state papers - he will be the constitutional monarch eventually. Kate will not be, though apparently she will be crowned as consort. As was said during a US presidential debate tonight, the spouse of a head of state forges her or his own path, usually by taking care of the distaff side of things and finding worthy causes to support and illumine. Kate very much seems headed in that direction. Blue hare, are you sure iit needs more than what Catherine does? If yes why? William and Kate broke up because William wanted out, royalfan. He obviously changed his mind, perhaps prodded by Kate taking advantage of the media, but there are a lot of anecdotes out there (or at least there were) of William going out, jumping on a table and yelling "I'm free!" after they broke up. Kate will be queen consort. No, she will not be head of state; that will be her husband's job, but she will be his consort and they will be King and Queen and heads of state. The Prime Minister is head of government, but as of now the monarch is the head of the country and commonwealth. The head of state is someone that people can rally round in times of crisis and someone who people look to for leadership. I'm not willing to discount the role of Queen Consort as some of you appear to be -- look at the QM in WWII. She was a big part of why George VI was able to be the presence he was during WWII. My mother remembers; she's Jean from Lancs' generation. The QM exercised her power behind the scenes -- whether she was benign or not in that is up for debate. Kate's job will be to work with her husband. Part of that will depend on how well he does, but if he's looking at state papers and assuming she's interested, she will be involved and giving her opinion. She will have a lot of power, and as of this writing I'm not convinced she'll be particularly effective in her role, unless life is good and all that is necessary is lovely hair, impeccable clothes, and the ability to relate to children. I think so far she has done very nicely, paralleling the Queen Mum's activities. She has already wielded influence in having a wedding buffet luncheon, taking George to her parents after he was born, sending George to local school, spending Christmas with her parents and other things that I don't recall readily but exist. Seemingly simple things, but in the face of stalwart tradition, quite an accomplishment. And she isn't even Princess of Wales yet. Don't hate her because she has great hair, style and is great with children. She is a lot more than just that and to say otherwise is denying the obvious. William doesn't call her his "rock" for nothing. The Queen has been rather mute and dutiful. Uh, for how many years now? I have a feeling you will be eating your hat in years to come regarding the last few sentences of your post Bluhare. Reporters, including those not partial to Kate, admit that she is intelligent and has a lot of backbone. It was mentioned last week again. There is no necessity for her to show it now, and there is no need for her to overpower William, but as these reporters have noted she will be the driving force behind William and already is apparently in their private household. I would not discount her that easily. I believe she will play a similar role to the Queen Mother and I think that is who she is modelling herself around. Because of the way that William purportedly jumped on the table and yelled, "I'm free", that convinced me that the breakup was a test by the palace to see how Kate and her family would handle themselves and the media in the event of a break up. William may have some shortcomings as we all do, but blatant cruelty is not one of them, particularly factoring in his respect and affection for Carole and Michael. It didn't take them long to see that the Middletons were handling the situation just fine. William and Kate were reconciled in record time. Anon 22:41, I do agree with you. I also thought it was odd that the breakup was announced officially. Very odd indeed given the Firm's no comment policy and William's desire for privacy. She was his g/f, not his fiancée; I did not see the need to make it so official. Yes I was just going to post... it's Carole Middleton coming through in that smile and the look in Charlotte's eye. Lovely girl. Gorgeous picture....thank you. Also, can Prince George be any cuter? My god, what a handsome and photogenic little boy. Heartbreaker already. Love the "dropped" Charlotte shoe. Classic (I detected a little Pippa in Charlotte, too...). The Duchess, spectacular (I really, really think those bangs are fantastic, she looks so attractive with them). Prince William looks handsome as always (still hoping for him to wear something other than navy blue, tho!). Silvia. What a lovely, relaxed, & gorgeous photo of the Cambridges!!! I see a little Pippa in Charlotte's expression, too, Silvia. The fallen shoe, the train, mischievous George, the Duke keeping his eyes on him, the Duchess in sneakers!! This just made my morning. George will have such fun at montessori. The thought of doing school drop-off/pick-up if my child attended the same school & seeing the Duke, Duchess, or Nanny Maria (plus security of course) is so funny to me! I'm one who has complained about the bangs; however, I must agree and admit they look wonderful on the Duchess in this picture. I live in the united States so I wo up around 5 am to get some water and checked my twitte and what an information overload! And in a good way! I loved the photo. Wish we had seen a different outfit on Charlotte though! Time does fly and George is starting nursery school! Do you think they will allow photographers to photograph his first day arrival like they did for William? I hope so! What a precious picture! I love the dropped shoe!! Very very nice! I think this is my favourite of their official pictures taken by someone other than Kate. Nice job! Love the little wooden train as well! Oh how big George is getting! Nice that he's going to Montessori! Also gotta say that I love Charles and Camillas picture! Very nice and sweet as well! Beautiful family photo--captures everything wonderfully. I like how even in a photo, William keeps an eagle eye on George! (LOL). This photo reminds me of the family photo celebrating George's first birthday and Kate had some baby drool on her shoulder. No need for perfection, because life isn't perfect and such little things like that or a dropped shoe, merely portray a real life with kids. =) They seem really happy in a realistic way. I wondered if this was taken the same day as the previously released Charlotte photos. Possibly Kate had her ready early and was taking some extra photos. That would explain the outfits. I initially thought the same thing, but when the photo credited to the Duchess was published, it said the photo had been taken at their home in Norfolk. Certainly that could have been an assumption, but I think even this blog referenced that. On another note, the Prince of Wales and Camilla look so wonderful! I love seeing him in just a tie! Thank you for your standard of excellence. What a Joy. I loved your whole post!! It would be very hard not to. We must be really content, we got beautiful and heart warming pictures from the RF this year. So happy they used a photographer who received his training in the British army. I hope he gets to photograph them again. OH, and, just for the record, every seated monarch on the throne of England in the future will also be a direct descendent of Kate, (after her father-in-law, and her husband), there will be her son, grandson or granddaughter, great grandson or great granddaughter, etc., etc. Who's laughing now? You never know what might happen. I have a strong feeling, though I hope I am prone wrong, that there won't be a throne for William or George to sit on. I don't the British Royal family will be around for long after the Queen goes. one world government. I know what you mean though. I have had those thoughts before also. Thank you, Charlotte, for a wonderful post. The photograph is gorgeous. They are a stunning family, but also have the look of someone that could be my neighbor. The dropped shoe and the little train were wonderful, as it shows the reality of life with kids, nothing is perfect. Great news of George beginning preschool. It'll be nice for him to spend time with kids his own age out side of home. I think all the Queen's attire is bespoke. Melanie, I believe the Queen generally wears Hermes scarves, but she holds on to them for a while so this could be from a line many years or decades ago! I agree it is exquisite... and maybe Charlotte can track it down! Also Anna who does the Sophie blog seems to have an incredible eye for identification, might be worth asking her as well. What it takes to make and curate every item in her wardrobe is astounding, I think Kelly heads a team of 12 if I remember, plus the people who have made her shoes, handbags etc all these years. I think Kate fans would enjoy it, as it might offer a glimpse into what her wardrobe may become, though I think on a much smaller scale as she'll be consort and frankly times have changed. I've read in Angela Kelly's book that HM favors Hermes scarves, though it is true that almost all of her clothing is bespoke. Thanks. Didn't know she ever went retail. A little off topic, but I was wondering how many pair of shoes you all have. :) I recently redid my closet and my family keeps telling me I have an inordinate amount of shoes. I have twenty-five pair including boots. Although I am very thankful for those I do not think it is an unusual amount. But I will add this, if you are happy and like them and they make you feel good wearing them, it doesn't matter one bit what anyone else thinks! If you're happy, so be it... the best moment in life is when you realize you wasted too much time worrying about what other people think! Rightly or wrongly, those are common comments on the show and I have been watching the show for years. (I was quick of course to point those comments out to my husband as we watched the shows). So, apparently, fashionable shoes are big business worldwide and even Imelda would have been considered shoe conservative by today's standards. Anon you're the first person I've heard say Imelda's collection would be conservative! I think she had 1200 pairs, 3000 actual shoes, something like that? So you have a long way to go! lol. I know. I don't know why they make some of the bedrooms so large and pitch it as a bonus. will do. That way I can show my family what having a lot of shoes really looks like. Adorable picture! Love that they released a family picture this time. Is it possible that Kate is wearing the same grey sweater-thing that she wore on that day off during the Australia tour when those pictures were taken of her and George playing? This is such a beautiful family. Thank you Charlotte. They loo so happy and contented so joyful. I love the family picture of the Cambridges. You can tell that they are a loving family and even though it is a somewhat posed shot, it is still perfectly natural, including the smiles and such a delight to see. To be perfectly honest (imo), who cares regarding the name brand of the clothes, I love the photograph and it makes my heart glad to see a lovely young family! They last for generations. I wouldn't be surprised if George's children play with that. The RF does seem to save a lot of stuff. I still have my son's wooden train set, Legos and Lincoln logs. Yes and these toys last and are always a draw for young children, my grandchildren also migrate to them whenever the come. Hey there neighbor! I'm in Phx, AZ. Charlotte looks like the queen! I think it's the same grey jumper she wore to the rugby game in Australia. She does have the scarf over the top in the rugby pictures, but they both look like the same color and pattern to me. She has such a cute family, I love this picture! You couldn't have put it more nicely! Merry Christmas and happy holidays to you dear Charlotte and all the readers of HRH Duchess Kate! what a lovely and lively picture ! far much more interesting than Charlotte's christning pictures, whatever glorious was the photographer !!!! I was wondering when George would start school, seeing how is parents seem eager to have him acquainted with "ordinary" (I do notuse this work in a despising way !) people .... I also like Charles and Camilla's photo, finally they do show their love , so happy for them to have reached some serenity and happyness ! What a lovely photo! I love how the relaxed setting, how they look just like a normal family of four! I think the setting reminds a lot of the autumn instead of this period of the year but they are such a lovely and happy family so this is Christmass-y! This my favourite family photo from The Cambridges so far! I think Charlotte looks like The Queen and Carole Middleton, she's gorgeous! I love Charles and Camilla's photo too, they look so happy and in love! I think the Duchess is wearing her Mint Velvet Plimsolls in navy blue. Someone on twitter said that it looks like Charlotte was photoshopped in but i'm not sure of that. What do you think? I'm not an expert. Although it is upsetting to think it might b photoshopped, the fact that Charlotte is in the same outfit and if you substitute that green checkered chair instead of Kates knee, the pose would be identical. This could bring up the idea of photoshopping. Also you cannot see where Kates left arm should be holding Charlotte. Possibly just supporting her from the back? I certainly do not believe this photoshopping rubbish! The other likely scenario is that after this photo session wrapped up, Charlotte was in a calm mood, and Kate jumped at the chance to take individual photos of her. Chris Jelf is a professional photographer, photographing this high profile family for the first time, so I very much doubt that he would have photoshopped Charlotte into the picture. It would ruin his credibility in an instant. I think that Kate's hand is under Charlottes dress. Also if you look at Charlottes eyes, in Kate's picture she is looking past the camera and in the family photo she is looking at the camera. Her hands are also in different positions. The pose is hardly identical. This is the same scenario as the photo of William, Kate, George and Lupo in the window. That photo was just weird and looked photoshopped all over the place. And now that someone has mentioned it, this current one looks similarly strange in the same ways. Where is Kate's hand? Charlotte is posed like she is sitting in the chair and William and George are at weird angles. Don't mean to rain on anyone's parade. I was so excited about the photo to begin with and then I read some of the comments, revisited the photos and it was so obvious to me. Why would they do the window one and then this is a very good question but something about both photos is just not right. I thought how strange it was that they released two different photos of Charlotte so close together with her wearing the exact same outfit, although I seriously doubt anyone is photoshopped into the picture. Also, it looks like Kate is holding Charlotte from underneath her dress rather than showing her hands; I'm sure it's so her dress will be seen. Catherines arm is under the dress supporting Charlotte. It is not photoshopped, no reason. They have access to professional photographers any time they want. Suspect they have a boatload of photos to choose from. I think you're right Rebecca! I can't think of them using a photoshopped photo. Charlotte's photos released last month were taken at Anmer Hall in Norfolk e not at KP so i don't think they were taken during the same day. I think Charlotte recycles just like her mum! I see that bunching but don't think it is enough for Kate's hand to be there. It doesn't look like Charlotte is even really seated actually on Kate's leg. I don't know. They have used false names at hotels before (as have Charles and Camilla), maybe they are trying to fool the public in a fun way with this photos. They had another photo in the palace window or something that was questionable also, remember? Nothing about this photo rings true to me. Who could blame them for trying to have some fun with it though. Rebecca, I think you are right. You can follow Kate's left arm you can see that her hand in under Charlotte's dress and right hand is behind her back. Anon 17:37 - Kate's hand would not bunch the dress out very munch at all - a hand is not that big. As far as her dress being the same one that she was photographed in by Kate, it fits in very well with the slightly more casual dress of the rest of the family others so it would be a better than a more fancy dress or rompers that most babies live in these days. Charlotte's position also different than the one in the chair. It would take a lot of "photo shopping" to add a shoe on one foot and another on the ground, Prince George leaning just at the right angle to fit on his Mom's right arm and Prince William stooping at the same level as the rest of the family with his eyes looking in just the right direction of George. I for one do not get the need of some to take a very nice gesture by William and Kate and dissect it apart saying it is not real. Is it any wonder they want privacy. I dare say you would all want the same in the same circumstance. I WOULD! Claudia, don't get me wrong, I am not dismissing editing to accommodate for lighting, for example. But this discussion of photoshopping almost makes it sound as if the photo was pasted together like a puzzle and that does seem a bit over the top to me. And as I sit here 24 hours later, I will say again that I am amazed that no one has mentioned photoshopping in reference to C&C's photo. Comparing the "lovely" C&C photo comments to the dissection of the Cambridge's photo is telling, me thinks. The photo is what it is and people aren't stupid. tells the tale.) This isn't the first questionable photo. And, obviously, even if the photos were technically perfect in every way, this side of heaven there would always be critics. always. Given the oddities of this and some other photos, the cause of concern is their own doing. There's photoshopping and then there's retouching. I don't think the Christmas photograph was photoshopped at all, but I'll bet it was retouched to smooth out imperfections just as Charles and Camilla's was. Love this post, Charlotte! Thank you so much. Big thanks to the Cambridge family for releasing this utterly charming photograph. The one of the Waleses is lovely too. The Queen must sometimes stop and perhaps pinch herself to find she's not dreaming that this branch of her family is in such happy circumstances after so long with stress and strain. May Harry and Andrew's branch all find such happiness soon too. Oh! George is so cute. 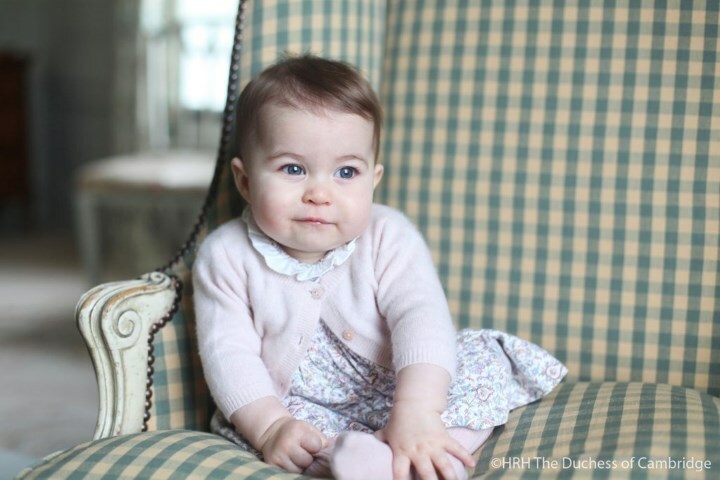 Baby Charlotte is a little charmer too; I agree with all those who see the Queen, Carole, Pippa, and Kate herself in the little girl's features. She is beautiful. I too love how it looks as if William is ready to dash after George, and Kate can't stop laughing at their antics. Happy Christmas indeed. Thank you for including photos of the Queen as well. Love when you do that! Yes, thank you Charlotte. It is nice to have the photo showing what the Queen is doing in relation to what Kate is doing on the same day. Nice perspective. Charles' s and camila's Christmas card is also lovely. Its very good to know that george is about to start his school soon... hope to see the day soon as possible... hope so William and kate will come with him to drop hom to school for his first day. Oh gosh trying to corral a dog and two children under the age of 3 for a picture may be actually impossible lol. Some candid pictures of the children and Lupo could be really cute though! I agree with Maggie here. It's difficult enough to capture just the right moment with two little ones. I am not implying that George would be mean to Lupo at all. I do think that he is persistent and very curious and active and could no doubt be constantly after Lupo. Toddlers don't always know to be gentle. So I feel certain that Lupo, like many other family dogs, has found his "safe" places in the palaces. Hopefully. I love that this photo just looks like all of the Christmas cards hanging on my door right now of all of my family and friends. Will really married a "normal" girl. I think you can see in many things, (this picture, going to a regular pre-school that costs $50 a day, Christmas with both families), that they are doing things the way Kate feels comfortable and how most people do things. I believe it will serve them well, the Royal way does not always seem normal to me. Wishing them the best. What a lovely photo taken in a lovely setting on what must have been a nice October day. What a pity this photographer didn't take the christening photos I know it would have been a more formal occasion but I think he would have produced better photos. It is interesting that W & K have chosen a small nursery school in a very rural setting for George and judging from the information regarding the children who are at present attending the majority of whom receive financial help they clearly want him to meet and play with children from all walks of life. I see that William and Harry both went to the same type of Nursery but they went to a private rather upmarket one in London. It will be interesting to see how they approach the press interest for when he first attends though I see that the school is down a private road so that should help on an on going basis. I look forward to seeing Kate and William on Christmas day I doubt if George will be there this year it would be a nice surprise if he is. Imo the pictures from both christening were bad so given that they were taken by different photographers, I think it indicates the incredible difficulty of getting those pictures to turn out well. There are so many subjects in christening pictures and they all have to look good. And that's even harder when it involves a baby or multiple children - for Charlotte's christening, they had to get George to cooperate for pictures after he already had to walk to church in front of a bunch of telling strangers and then sit through a church ceremony...all before he was even two! And with the Queen and Prince Philip there, I doubt anyone would feel comfortable keeping everyone waiting while they tried to get the picture right. Whereas for these types of pictures, they can be scheduled for a good time for the children, the children will be at home (and not surrounded by a bunch of people they barely know) and thus more comfortable, and there isn't any rush in terms of keeping the monarch waiting while trying to get some good pictures. I just think it isn't fair to really put the quality of the christening phtographs on the photographers - those events seem very very challenging even if you don't factor in the added complexity of having two families and multiple generations to capture well. Very true Maggie. Although, I personally feel that Mario Testinos style doesn't generally lend itself well to formal portraits and kids photos. He's great when photographing laughing adults or fashion spreads, even the more natural engagement pictures. But it wasn't a very clever hiring of the Christening photographer in my opinion. Merry Christmas everyone! So great to see this lovely family together, they are so happy and content, and show so much joy...it is an uplift to the spirit after a difficult week. Thank you Charlotte! Opening this blog is, as was said above, very much like getting to open a gift. You give so much joy and pleasure to all of us with these posts. Has anyone looked at the pictures of the Queen Mum when she was about 10 years old? There is a partial profile picture where I simple gasped "I see Charlotte!" when I saw it. The look in the eyes is very direct, clear, and focused. I also see Elizabeth II, and Carole. She is going to be a beauty for sure. Jen, I agree that Charlotte looks so much like the Queen Mum. I googled childhood photos of the Queen mum but didn't find the one you mentioned. The other photos though also look so much like Charlotte. Lovely photo of the Cambridges! And of Prince Charles and Camilla, as well! Happy Christmas to all! OMG, I love that it's a casual shot of the four of them. And Charlotte looks so much like Carole. What a beautiful and happy family. And I like that Kate chose these earrings; not without some thought, IMO. Like I said above, I love this picture. George is incredibly adorable and I love the serenity Charlotte seems to have in all pictures of her. I'm glad the Cambridges released a Christmas picture, and I hope they keep doing a family one every year. Two things -and these are not criticisms! Just me analysing photography for fun. One, does anyone else think Charlotte looks a little out of place in the picture (almost photoshopped in) and that that may be because she isn't dressed to match the others? Everyone else in the family seems to be wearing something that is a vibrant color that pops - I.e. the deep blue of George and Kate's pants, and William's shirt. Charlotte, on the other hand, is only wearing very pale, muted colors and is propped up against the background of Kate's pale grey shirt. I feel like if they put her in a deep blue cardigan (or even a different color as long as it doesn't clash with blue and is also dark/vibrant) then she would look less out of place and the picture would go from lovely to holy crap it's the perfect family picture. Not that it's not perfect or anything! This is really not criticism - just wondering if someone else had the same feeling about the picture. It's just been bugging me why Charlotte seems so out of place in the picture and I can't quite put my finger on why. Second, I do hope in the future that they release more candid shots instead of these posed ones. Again, I'm not complaining! This picture is wonderful. I just think the pictures usually released of Princess Estelle are so charming and usually show a little bit of personality. I also think the release of these kind of posed shots don't satisfy the demand for pap picture because they barely provide insight into the Cambridges' lives and people have a benign and understandable desire to be let in a little. Pictures of the children playing in the yard, etc, would do better to fight demand for pap pictures and would be a nice way to include the public a bit in the lives of a future monarch and sibling - lives that will always be at least partially funded by taxpayer money. But just a thought! I agree Maggie, I'd like to see some candids, ideally a photo op in the KP garden, at a playground etc, with a handful of the royal photographers. The family could come out for a 15-20 minute photocall. This provides a few things, different photos from different perspectives, (different talents at work) and a chance to interact with the children and to see how Kate & William interact with them. I still remember when William went up to examine the tv and still cameras and everyone was just delighted! Not to mention the good will it would create with the photogs and press... maybe for Charlotte's first birthday?? And yes the few photo ops I've seen of some of the other European royals are fantastic. I can see why Charlotte looks as if she might be photoshopped in, but I think the telling detail of the one shoe off and one on, with the missing shoe down by the train, lets us know that this is not the case. It looks to me as if Kate is holding onto her underneath her little dress so as not to cover up her outfit. Remember this was taken before the green chair shots--or so it's said--as this was said to be the last week of October and the ones by Kate were taken the first week of November if I remember right. I do see why she looks almost out of place. I think it's her serenity. George is simply bursting with energy, and William is coiled like a spring ready to pounce on him if he runs off (again? ), and Kate is trying to maintain focus so that the poor photographer has a miniscule chance of catching the family all looking good. 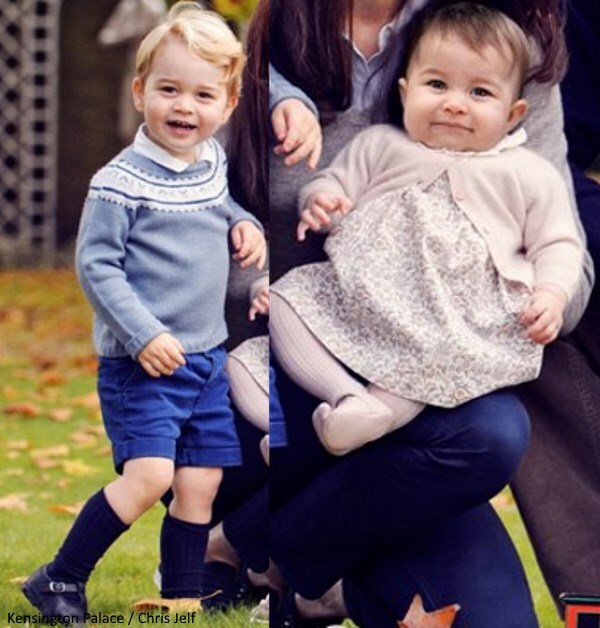 I do think this is a really telling picture regarding all of their personalities--George being the "monkey" and the "handful" that he has been reported to be, and William being George's wrangler-in-chief while Kate hangs onto little Charlotte, who is calm and "ladylike" which I take to mean easy-going. But I agree with you, Maggie, that it would be very nice to see some of the shots that didn't "work" as well as this one--like one of George running off with William in pursuit, and Kate collapsing in laughter with Charlotte in her arms. That would have been wonderful to see, as wonderful as this picture we DO see. Icing on the cake, no? I would love to see one that you describe too, of the children playing together. Perhaps we will when Charlotte is a bit older and able to interact with her brother. Having seen it in full when it happened Rebecca it was nothing of the sort. The regular corps who covered the Prince & Princess of Wales were there. They put down their cameras to say hello so he could see and meet the people behind the cameras, the TV videographers let him look through the viewfinders so he could see what they were doing. And the small corps back then was a fraction of what faces the Cambridges today, wouldn't even remotely compare to what was waiting for George outside the Lindo wing when he visited Charlotte for example. Isn't it better to let the children get to know the people who will always be showing up at events to photograph them? To let them see the equipment to get a better understanding of it and what they do with it? Yes, there's time for that, they're still young, but I would think better to let them get to know the official, credited royal photographers as soon as possible, they're going to be around them for a long time. Not to mention I would want them to know quickly who the "good guys" are, to differentiate them from more reckless paps. Oh no I think I must be the only person who doesn't like the photo. Kate and George look great, but Charlotte looks uncomfortable and William is at an awkward angle almost not part of the group. Anon I think it's a nice, natural photo, but agree the composition is not great for William, he is too much at an angle, Kate and kids should be turned a little more in, or he should be slightly forward. It gives the impression that it was a Kate and kids photo, which is why it was so easy for the Times to crop William out completely! But it's the best we've seen, the christening ones were fairly bad, and actually get worse every time I see them... They look like caricatures or their own look-a-likes or something! Shame, because Testino must have cost a fortune. The one of both of them with George and dog in window I thought very nice and natural as well. I agree Claudia. This is not a "natural" photo. It has been photoshopped big time. I thought the one of the three of them with Lupo in the window was photoshopped also because of the way George is supposedly looking at Lupo and because of Lupo's position. Just weird. And the Testino photos......, I won't even go there they were so creepy. don't mean to rain on anyone's parade but the parade is more like a charade. It's funny Anon 1800, I thought that window one was nice, but reading the other comments I realize I'm in the minority! Of course I wasn't reading blogs then, only saw it in a magazine or paper, so didn't study or analyze it :) Maybe I should google it now so I can see what everyone is talking about! good thing to do Claudia. Notice where George is looking and at the position of Lupo, etc. Nice photos of both the Cambridges and the Prince of Wales and Duchess of Cornwall. I agree with some previous posters who commented that while the Cambridge photo is nice, it's still posed (even with the supposedly "random" shoe and toy train), not satisfying for those who want to see the royals acting somewhat human and in action. An aside about the Christmas tradition at Sandringham - I've always thought it sounded so quaint and wonderful but I've been reading Tina Brown's book "The Diana Chronicles," which describes the whole Christmas travail, from arrival to the 19th-century era protocols that are still rigorously followed by the queen and her servants at Sandringham. Talk about dreary!! 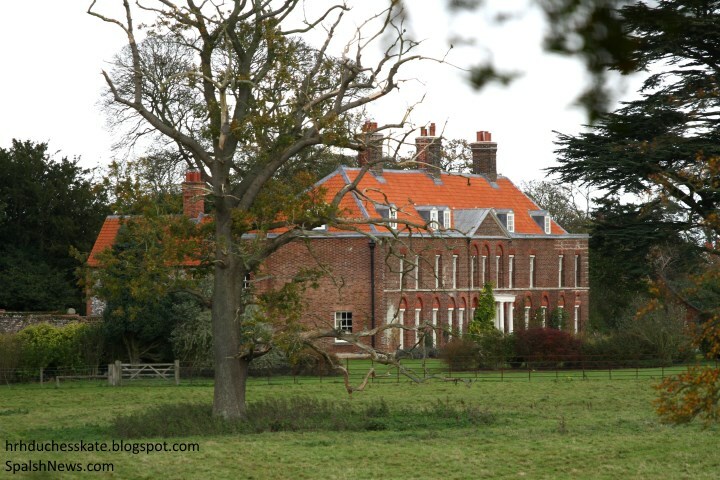 If you read the account, you'll understand immediately why William and Kate chose - as soon as they could - to spend a fairly normal Christmas holiday with their children and Kate's family at Anmer Hall. I think they choose to spend Christmas at Anmer Hall because at Sandringham, small children have to eat in a separate room and I imagine that they are keen on including George & Charlotte and providing them with a happy family Christmas. Actually it is these "19th-century era protocols" that have the allure for me and I suspect others in following the BRF and anything but "dreary". I certainly hope William and Kate find a way to incorporate these traditions into their future Christmas celebrations. As far as the comments made about a few posters in regard to the Cambridge photo and that it is "not satisfying for those who want to see the royals acting somewhat human and in action". This photo was given as a gift to the people of Great Britain, these comments come across as "Thank you, but I don't like your gift and I don't want it, take it back and give me this instead". I enjoy the protocols also. Great British heritage and tradition. Part of what makes Britain, Britain. Lovely photograph. I really like that the photographer is an ex-serviceman embracing a new career. The family all look so happy. Doesn't Prince Charles look so much like his father. He looks alot older in the picture but then I suppose he is nearly 70. A great post Charlotte. THANK YOU And enjoy Christmas. Absolutely beautiful family and picture! Love it! Everyone looks so joyful! 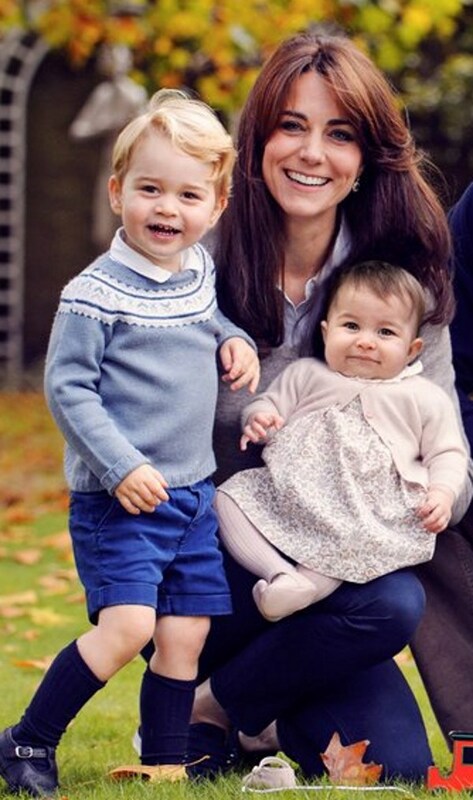 George's smile is adorable and Charlotte looks so ladylike and perfect. Such a precious picture. Happy Christmas to all! PS...Kudos to the photographer for capturing the kiddos perfectly. Having 4 of my own, I know how hard it can be to get a good picture. He did a great job! 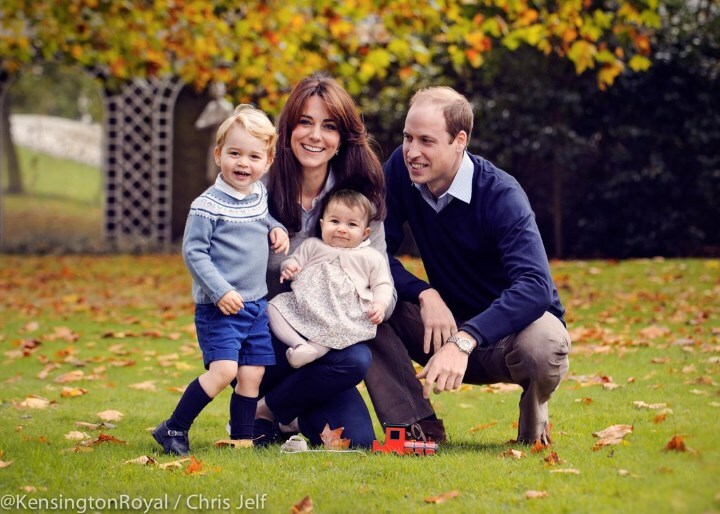 That is one gorgeous christmas card and one gorgeous royal family! I love Charlotte's little smile! What a treat! Charlotte your post is quick all right. Prince George looks like he's on the run. And princess Charlotte oh my stars! What a cutie! Her shoe, his train. Kate looks great as always and William looks so natural. Where's Lupo? Happy Christmas everyone! Sending happiness and cheer from sunny Southern California, Redondo Beach. nge that William was photoshopped into the the photo - the original was of Kate and he children. If you follow where Kate's right thigh is and then look at Charlotte's sitting position in relation to that, Charlotte is actually floating in that situation and not resting on Kate's thigh, not to mention how Kate is holding on to Charlotte or William and George being at weird angles in the photo. I honestly am not trying to cause trouble, I am just trying to find out why the photo looks off. It does resemble the window photo that was taken with Lupo in it. In that one, George was not looking at Lupo although it was supposed to appear that way. I have no clue as to why they would do something weird like that, but the photos are not as they first might appear. Maybe William disdains the media so much that he enjoys the game. W/K have left hints before with the two Prince of Wales feathers, the Diana maternity dress, the historical photo poses, etc. so that Photoshopping the two photos is not so unplausible. I just know that there is something off about the two photos and it doesn't take a rocket scientist to discern that. The shoe and the train being where they are looks staged. No offense. Why would they bother doing that???! Who knows. But the real question is why do both photos look like that? Both parents hold their babies in the recommended way, with one hand underneath grasping a leg and the other firmly around the middle. Kate knelt down from a standing position, holding Charlotte carefully and with her hand under the dress so she does not obscure it. Has anyone else noticed that George's jumper is from a Spanish company? Perhaps it was also purchased by Nanny Theresa or her mother. Charlotte's bottom is not even resting on Kate's thigh. I do think George's sweater is most likely a gift from Maria. Why would she gift those gifts to Charlotte and none to George? The sweater is beautiful. It has been the most splendid royal week - I love Kate's new hairstyle - it's fresh, sophisticated and natural looking. I always liked her hair long but in the last year it seemed to be giving difficulties and we didn't get the great styles of the past as much - instead ringlets and fiddling. And while her hair looked nice with the big curls, it also looked very formal - this is a much better working style. I love her in red and she has worn two of my favourties of late - and such a delightful engagement with the drumming at the Anna Freud Centre - and so exciting about her new patronage. I was surprised too when I first heard but the more I think about her family background, it makes perfect sense. So nice to have a young patron for the air cadets too. My dream is she will soon take over the Princess of Wales regiment from Queen Margrethe - who is getting to the age where it would make sense for her to relinquish it. Perhaps they will wait until Kate is POW but I don't see the need. The card is lovely -the perfect balance between formal and informal - and outside of the Christening, the first time we've really seen the family together. By releasing it, they seem to be more understanding of the public interest - at a time when many are speaking out against the royal family (those who praised the Guardian should look to some of the other articles - that "nice article" was nothing more than a dig at a fellow paper while publishing other articles about how some feel the queen should leave Buckingham Palace and have it turned to a museum - it's so important to encourage the "silent majority" who want it to remain. The only quibble I have is the missing family member - where's Lupo!! It's been too long since we've seen our favourite black cocker. And in the spirit of Christmas, I will say Charles and Camilla look good in that photo. Since we must travel in a day or two - Happy Christmas to all here and so excited to see what the next year will being for Kate and her family. I agree! Where's Lupo? He's disappeared this past year. wasn't he in the pap photos of George and Carol at the beach? Have a good journey, Julia, and a happy Christmas! I don't know, Julia. The aristocracy is extensive and very entrenched around the throne. I don't think it will topple all that easily. I hope not. Can it survive the vestments of one world government though? I hope so even though I think the past and current streamlining of the royal family may be part of that. There are those who say that the throne has an integral part in the formation of a one world government in the first place and that all wars or political transitions have been orchestrated by that same elite power group. I am not so sure about the RF's role in all that. I remember when the Queen's ship was retired and no replacement made and she actually cried. You would think that if the Queen wanted a new ship she could get one. Hmmm. Paul Burrell, in his first book about Diana,(excellent read btw), warned Paul in a subtle way when something was going on in the palace during his tenure with her, that one had to be very circumspect in their conversations and actions as there were political powers at work behind the scenes that weren't not known to many. The implication being the existence of that power elite that are usually only mentioned by "conspiracy" theorists. Even considering those things, I think the throne will continue. It is such an integral part of British history and a bonus the current economy. Some would say that the throne is the heart of Britain. 01:47, the awkwardness of Charlotte that you mentioned was the very first thing I noticed when I saw the photo, plus her being in that dress. Her photo looks like it was pasted onto the photo or something. I REALLY wanted to like the photo but there is just something about it that is wrong and I don't know exactly why. I like the picture of the Cambridge and of Prince Charles and his wife. They look very nice. Merry Christmas to all! Beautiful photograph of an obviously very happy family. I very much doubt is is photoshopped. Look at the way the light hits their faces - the same for all four of them. When Catherine took the ones of Princess Charlotte, you can see that she used some kind of lighting - it's reflected in the baby's eyes. Looks like natural light only in the group photo. Also it looks like Catherine's hand is on Charlotte's belly under the dress. I think the shoe and the train looked staged and the photo photoshopped. Don't ask me why they would do that because it is anyones guess. I know, just let the Cambridges retreat to their home, lock the doors and never do anything again. For no matter what they do, they will be criticized or accused of some foolish fantasy. Very surprising news to share. The Sunday Express reports the Cambridges will spend Christmas day with the Queen at Sandringham and not Anmer Hall with the Middletons in order to give their hard-working staff a festive break. That is odd. William just said that they would be at home other than Church! Besides, I thought they did things themselves (at least the cooking part), so they wouldn't need to give staff off as they'd already be off, right? Charitable bluhare is wondering if it's so the protection staff can have the day off. I think you're correct. I wouldn't have thought they had staff at Anmer on Christmas Day apart from protection officers (I might be very much mistaken). I think many of us had presumed last year's Christmas was the beginning of a new tradition. It's surprising news. Perhaps they plan to alternate between both families? I think you must be right about the protection officers, bluhare. If not, they are obviously much more dependent on staff then we thought. Wow this is kind of depressing. I did not think they were so reliable on staff. You would think that since Kate grew up normal for most of her life, they would cook as a family and be together informally. Is the Sunday Express a reliable source? Camilla Tominey wrote the piece and she tends to be very reliable. The full article is online now at the Sunday Express. I thought they still had the cook, the one originally from Buckingham Palace, the nanny, and a housekeeper, and a night nanny. They had advertised for domestic help. The article mentions the housekeeper from KP who most likely travels with them, and the housekeeper they hired for Anmer, and a "man Friday". These plus the nanny hardly qualifies as been dependent on staff considering the size of their homes. Not sure that the statement that George and Charlotte will attend Church is correct. Reporter Victoria Arbiter notes that it was always the intention that Christmas this year would be with the Queen. In reality only Will and Kate and their immediate family know how it will be spent. William said less than two weeks ago (?) that they would be going to Church and then home to Anmer. That doesn't sound like it was "always the intention" to be at Sandringham all day to me. The Dreaded Daily Mail also has an article up right now talking about how Kate's decked Anmer's halls for a family Christmas to be spent there. Not sure who's right, but it's interesting! The article also said William got the day off from piloting to have Christmas with his family. I didn't think I'd have to worry about my hat, and now it's definitely safe! I would doubt very much it has anything to do with the protection officers, all four of them have a dedicated PPO at all times, even Charlotte, they would never be taken off duty. I think something strange may be afoot. Camilla Tominey I know as an excellent reporter with strong sources. Katie Nicholl I only know by reputation, but my understanding is she's had strong sources within the Middleton family... or their circle of friends. These are two very different stories which makes me wonder a couple of things... William is known to "leak" things to people to test their loyalty... were a couple of people given separate versions of events? Or is someone else in the royal family trying to take a swipe at the Cambridges with the Nicholl article? She's usually fairly pro-William and Kate, and this seemed an odd tone for her. The one line that stood out to me by Nicholl "it's the Cambridge way or no way"... that does have an element of truth to it. Normally my money would be on Tominey, but I find it very strange that their first Christmas as a family of four they would choose to leave their own home. I also agree with Erika, that I think they're capable of giving the staff time off without needing to run for assistance to the big house. Lol bluhare, I think many of us would have been surprised if you had to eat that hat. I am questioning the reliability of this article. Maybe it's me, but a few things don't make sense. First, I doubt that plans are made to accommodate staff. Besides, how many staff members does it take to prepare a Christmas dinner? And if they are going to Sandringham to give the cook a break, then it's likely that the nanny will be needed where she may not be needed if they spend the holiday at AH with the Middleton's. And I am not sure their PPO's would be off regardless of where they spend the holiday. Also, if AH is so close to Sandringham, why would they have to sleep there, especially with two little ones? Perhaps W&K will go back to Sandringham after church, but that does not necessarily mean that the rest of the story is factual. Antonella Freesolone is still their cook. I don't buy the latest news. William himself said that they would spend Christmas at Anmer. I don't think that Camilla T is as reliable as some seem to believe. IF it's true, I don't think staffing had anything to do with it. I think IF it's true, a decree came down. And it may even be for a good reason. All that being said, it's not that big a deal. Plenty of families alternate holidays between the in-laws. Merry Christmas Charlotte & everyone! Such precious, adorable children. Seeing the royal family just makes me happy. Merry Christmas everyone! 2013. I haven't heard that she has left. Then they advertised for other additional help in general housekeeping so I don't know total how many "servants" they have. Charles and Anne and Andrew have quite a few as does the Queen. I would assume Andrew does also. Exact Information on all of that seems difficult to find. Would love to know. I read today that they have one housekeeper at KP which is Antonelle and they have a housekeeper/cook at their country home. They also have a handyman/driver in the country too. So that is a total of 3. So it sounds like Kate and William do a lot on their own. didn't like the Katie Nichol's article at all. Offensive to "middle" class and really negative to Kate. That article was snarky and not even cohesively presented. And as far as any "sources" saying "it is the Cambridge way or no way", I seriously doubt that the truth of that statement and even including such a thing sounds like sour grapes to me. I found the references of chotskies and middle class insulting and arrogant. A slur to all middle class people but obviously to the Middletons. I hate it when Katie acts so gossipy and prissy. yellow Journalism. Sour grapes and yellow journalism indeed. Apparently, the fact that Miss Catherine Middleton walked down the aisle of Westminster Abbey and exited as HRH The Duchess of Cambridge is a bitter pill to swallow. The size of Amner and their Kensington apartment would dictate at least as much help as they are purported to currently have. I don't think it is a lush amount. Think of Charles and Anne and Sophie and the Queen and Andrew, etc. William and Kate's pales by comparison, so I think they are complying with their desire to try to do as much as they can effectively and efficiently. No, I think they make due with a conservative amount of help too. I was just remarking that if they couldn't stay at their own home because they were giving staff the holiday off, then they must really depend on their staff a lot. I'm sure they could handle being there without a staff for a week or two just fine if not working. Their Christmas plans seem to be about as confusing as their Christmas photo. lol, 13:19. They certainly are. I wonder why? 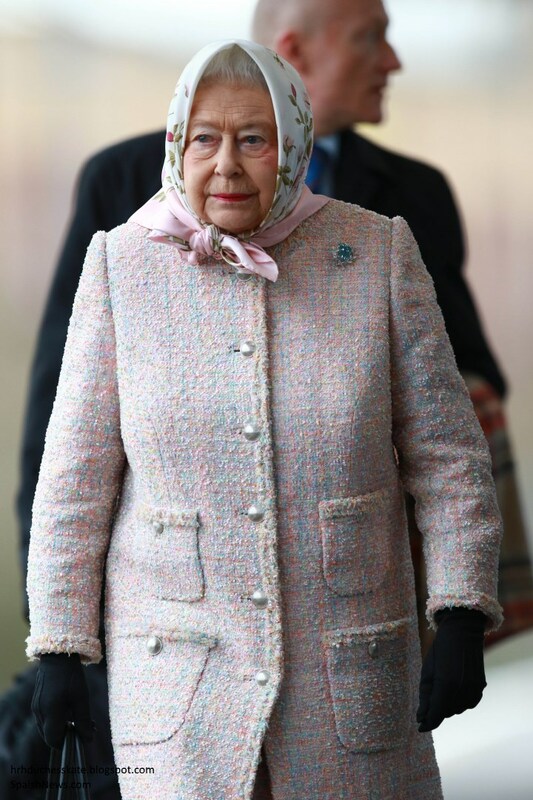 I seriously love the Queen's scarf, can anyone identify the make? The comments about the picture being photoshopped are ridiculous. You can see Kate's left arm beneath Charlotte's dress holding her onto her leg. Her other arm is likely behind George who, like a typical 2 year old, is probably trying to run off. And William's eyes are definitely focused on George. The fact that Charlotte is wearing the same dress as the other released photos of her just goes to show that the releasing of this photo was not planned in advance. Otherwise I'm sure Kate would have chosen a different outfit for her. Not sure what shoes Kate is wearing....I've never seen her in Navy Mint Velvet sneakers, although of course, that's what they could be. At first I though they might be Supergas, but I was in Zara yesterday and saw they have a pair of Navy slip ons that go up rather high on the front of the foot, and the shoe that Kate is wearing looks like it does that. I didn't think Photoshopping was a possibility either at first and then I studied the photo and I now agree with the others here that think the photo was photoshopped. Everyone has their opinion and that is mine. As people have previously shared, everyone believes the Queen's scarf is Hermes. Claudia @ 02:30, so does the photo. Anything is possible with photoshopping. However it is extremely hard for lay people to detect if it is done properly. I would not expect sloppy work from comissioned work. I photograph children and all sorts of different poses happen because little ones live in the minute. However why the angst?. Some of the picture will be intentionally posed, probably the train and some like the shoe just happened. There would have been hundreds of shots taken on the day so it is unlikeky the degree of ohotoshopping suggested would be needed. If one looks at the photograph as a portrait and not at who the people in it are it is a good portrait in that it is well balanced, the focus is clear on all four individuals and the photograph shows character and tells a story. It is again if one discounts who they are a good depiction of a family unit - a loving mother central to the unit with her babe, the overal watchfullness and implied protection of the father and the toddler bursting with energy about to escape and live life. I feel sometimes we overthink and overannalise things. Just as with the whoke Christmas Day stuff. There are all sorts of good reasons for either decision. PP is 95 maybe reasonable for close family to celebrate with him. Little ones better in their own home and on and on one can go with reasons. However whatever happens I am sure that the decision would have been made weeks if not months ago. Again I find the angst by us who live these lives vacariously interesting. Thank you alimai for your thoughtful (and professional!) response. It seems our society wants to look for spiders wherever they can find them. Why would a professional photographer photoshop something and call it natural because surely his "professional" colleagues would call him out on it. And when someone commented "Their Christmas plans seem to be as confusing as their photo" it only goes to show how gossip gives us the feeling that we can comment on people's plans. I am sure their Christmas plans aren't confusing to them and that's what counts. No. It is only natural for the eye to take in the gestalt of things. That's why some have mentioned uneasiness about the photo. Others have pursued the uneasiness to find Photoshopping. That it was staged for composition, even with that, is expected. Even apparently "unsuspicious" readers felt there was something "off" about the photo. One would have a natural expectation of integrity from people in public service. Where there is smoke there usually is fire. I studied the two photos mentioned myself and was saddened and astonished to find that, in my opinion, the photos are indeed photoshopped. I am still in astonishment and not just a little concerned. I am reminded of the Editor of Harper's Bazaar and/or Vanity Fair saying the balcony photos in France appeared staged. They felt that strongly enough to put their opinions in print. I am definitely going to refocus on something positive. Those photos left me with an oppressive feeling and lots of questions. One would hope the best. Time to move on to Christmas celebrations.